If the exclusive story coming from Kano is anything to go by, then all is not well with the newly appointed Emir of Kano, Emir Muhammadu Sanusi II. According to top security sources, Emir of Kano, Sanusi Lamido has been placed under a suicide watch. Few months after his ascension to the throne of Emir which was done by political appointment, Lamido Sanusi began showing symptoms of severe clinical depression. The symptoms reportedly grew worse. According to our source, the occupant of the Emir’s seat, began having thoughts of suicide. “He is suicidal. He is secretly being watched by his close aides”, said the source. 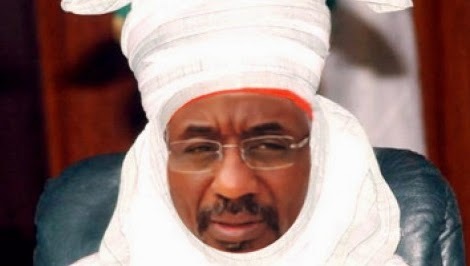 However, another source from a popular political family, the Yankassi family in Kano who is considered a family friend to the Sanusi Lamido Sanusi family has called the claim of Sanusi Lamido Sanusi being clinically depressed false. In his words, “Very untrue. In fact I just came out from a meeting with him and he looks very stable with sound mind”. Sanusi was made the Emir on the 8th of June 2014 by appointment while the heir to the throne, late Ado Bayero’s son was brushed aside by powerful forces in Kano. Come to think of it, how do they expect a professional with several years of experience to be happy being confined to a palace. In a recent Press Statement, Witches and Wizard Association of Nigeria says Sanusi has stepped on powerful toes and that he has so many enemies. Chei! Sanusi don enter soup o. Hope he survives it. chei! l hope he survives it oooo! Oops! It is quite that Sanusi has put himself in this web of problem. He could have enjoyed his life without this royal furore and challenges. Chei! This one na one chance o. So they just discovered now that he has mental illness? it takes a mental illness man to take what does not belong to you. i hope he depart soon dead or alive , so that the real Emir will take his rightful post. Obinna, you are a ****. How can ur thought be too ****? I think your brain has *****. If Emir Sanusi happen to be your brother, will u have such thought about him? What ever u so, you will surely reap it. sanusi is the biggest fool in the whole whole world! in fact a very big blind fooool! and he shall rot in hell! the same sponsor of book haram, his appointment as emir is just a dividend by Muslim elders to reward him for the role he played in assisting g book haram with Nigeria funds and also introducing Islamic banking. you all have failed, and he’s death is so neat. What does his agenda look like? To rule by upholding peace or to give those bastards called boko haram free hand to operate, as pple have always speculated that he is one of the financiers of this wicked group. He should search himself, repent & call on God for forgiveness, and God will show him mercy. Really Emir is the Son of the late Emir of kano,he become the Emir cos of power ,money,name and help of the Kano Govt,plus problem between him, Gov and president,that reason they put him to be Emir,is not right person, the late Emir son is the next Emir,depart b4 to late. is sunusi not from kano royal family? this kano emirship belong to kano people it concerned them all what we are saying is just democracy knowledge so is better to leave the issue on kano people do you any person apart from sunusi in their family? Dine & Wine with evil forces. That is the reason he’s handicap to make any vital decision that will effect a positive change to his people. I’m still in a shock since I heard from your President that Boko Haram is our siblings leave them alone so they can wipe away the rest of populace then, I knew something is wrong with your President. If Sanusi if suffering from depression, then your Oga at top is suffering from Boko-dementia. Malay, continue to pray to your God who I believe supersede their God. The will of God is greater than the will of man Mortal. Nawa o. Witches & wizards are now soothsayers of this country called nigeria. Very soon armed robbers will soon be the making in this country. This poster should go and make proper research because his claim about Sanusi not right for the throne is based on heresay and mere asumption. It is Oga at the top that wanted to cause confusion in Kano but God is the best of schemer. As regards that of the witches and wizards that is just their wish but not of God Almighty. HE will protect Him and his family because darkness can never overpower the light.